South West in Bloom are very proud to have Lord and Lady Fellowes as our Bloom Patrons, we would like to entent our thanks and appreciation to them both. Our recent awards presentation event in Taunton was particularly special for us when both Lord and Lady Fellowes attended the event. Everyone who attended really enjoyed and valued their company. Bloom is such an undervalued campaign, given its many outcomes but it has changed to recognise the value of people involvement in the environment and volunteering, as well as quality horticulture. We are honoured to have two Patrons who clearly share and recognise such values and we look forward to working with them in our future activies. 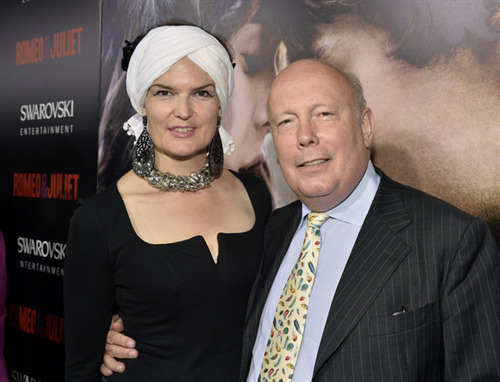 The Lord Fellowes of West Stafford, DL. Julian started work as an actor but is best known as a writer. His first film script was "Gosford Park", directed by Robert Altman, which won him the Oscar. He wrote the scripts for "Vanity Fair," "Young Victoria" and he worked on "The Tourist". He is responsible for the "book" of the Broadway musicals, "Mary Poppins" and "School of Rock" and he has been nominated for a Tony for the latter. He has also written two Sunday Times Best Sellers, "Snobs" and "Past Imperfect." He wrote and directed "Separate Lies" and "From Time to Time" both of which won several awards. He is the creator, writer and executive producer of "Downton Abbey" for which he has won three Emmys, a Golden Globe, a Special BAFTA, and many other industry awards. Julian is involved in various charitable organisations with his wife, Emma, as well as being head of the "Talking Books Appeal for the RNIB. The Lady Fellowes of West Stafford, LVO. Emma, as Ldy Emma Kitchener, is the President of The Lord Kitchener National Memorial Fund and the Kitchener Holiday Home in Lowestoft. She is heavily involved in The Stroke Association, chairing the Life After Stroke Awards, co-chairing a gala dinner at Buckingham Palace in March and taking part in an annual sponsored bicycle ride. She is Vice President of Flora and Fauna International and Patron of the North Dorset Home Start. Emma and Julian together are Patrons, Vice Patrons or Ambassadors of the following: Breast Cancer Haven, Cinemagic Belfast, Dorset Blind Association, Families for Children, Pan Pals (pancreatic cancer), The Rainbow Trust, and they are both involved in a new appeal for Alzheimers. She is lady-in-waiting to HRH Princess Michael of Kent.